And here you thought bedbugs were the biggest source of anxiety for hotel guests. What the heck’s a “death ray,” you ask? Well, first off, it’s not as deadly as it sounds, since no one has actually died from it — at least not yet. But according to the U.K. Daily Mail, the powerful beams of Nevada sunlight reflecting off the glass hotel onto sections of the hotel’s swimming pool area have burned some guests and have melted plastic bags. The building’s concave design creates a sort of magnifying-glass effect. The hotel’s designers reportedly anticipated that ill-situated humans might experience some discomfort courtesy of the building’s blinding glare, so they placed a film over the glass panes of its many windows. Obviously that didn’t quite do the trick. So for now the hotel is placing larger umbrellas in the pool area while designers try to come up with another remedy. According to the Las Vegas Review-Journal, the hotel’s employees coined the term “death ray” to describe the intense reflection. Reports of the glare have also enhanced the hotel’s public profile, though almost certainly not in the way its owners would like; Yahoo! 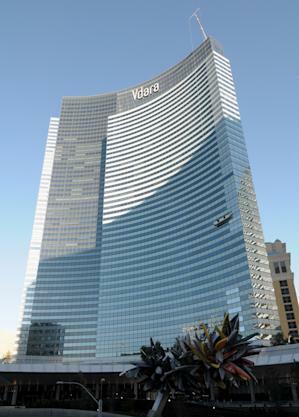 searches for Vdara have spiked by nearly 19,000 percent in the past 24 hours. It turns out that Vdara isn’t the only building out there creating intense heat and glare for hapless passersby. Gordon Absher, a spokesman for MGM Resorts International, which owns Vdara, told the Review-Journal that in Las Vegas, the AdventureDome at Circus Circus and the Mandalay Bay produce “hot spots” that some guests have actually sought out, believing the spots will aid tanning regimens. In Los Angeles, the Frank Gehry-designed Walt Disney Concert Hall produced such a harsh glare that it heated nearby homes, forcing residents to blast their air conditioners high above their customary capacities in order for the residents to keep cool. In another interview, Pintas said: “I was effectively being cooked.” Thankfully, he returned home alive. Still, his skin was burned and his hair was singed — disproving the old saying that whatever happens in Vegas stays in Vegas.